Gel permeation chromatography (GPC) for the analysis of hydrophobic polymers has traditionally been conducted using a differential refractive index detector. However, when UV-absorbing trace-level additives are present along with the principal synthetic polymer component, these are sometimes analyzed using a UV detector or photodiode array detector (PDA) for highsensitivity detection. However, a combination of a differential refractive index detector and UV detector makes it possible to conduct simultaneous analysis of the principle component along with any trace-level additives, and further, permits calculation of the molecular weight distribution of the polymer, confirmation of the UV spectra of minor components, and quantitation based on the calibration curve and qualitative analysis results. 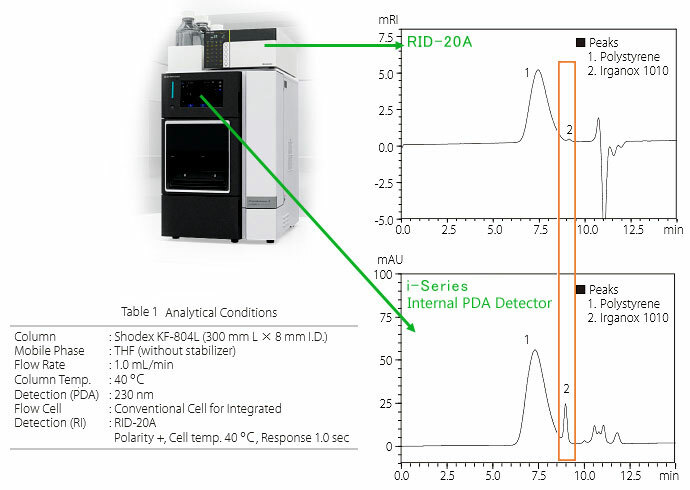 The Prominence-i Plus integrated high-performance liquid chromatograph supports connection with the RID-20A differential refractive index detector. In addition, as the column oven can house up to three 30 cm columns used for GPC analysis, applications that require a long column are also supported. Various types of additives, including plasticizers, antioxidants, lubricants, vulcanization accelerators and flame retardants, are generally added to polymers. This content presents an analysis of Irganox 1010, a typical hindered phenolic antioxidant which is added in small amounts to polystyrene (PS). As shown in Fig. 1, the Irganox 1010 peak was detected directly after PS, which eluted at about 7.5 minutes. 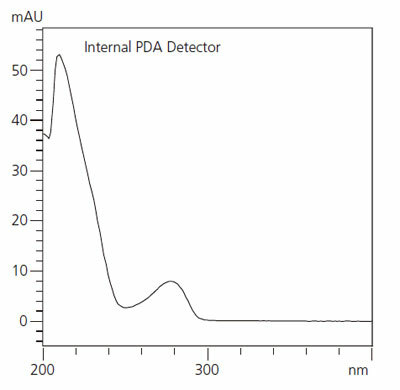 The additive peak, which was barely detected by the differential refractive index detector, was detected with high sensitivity by the PDA detector by optimizing the detection wavelength, thereby permitting quantitation. Also, as shown in Fig. 2, qualitative analysis of Irganox 1010 is possible using the UV spectrum obtained using the PDA detector. Fig. 3 shows the calibration curve of Irganox 1010 analyzed using the conditions of Table 1. 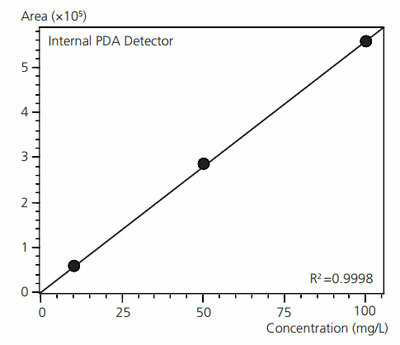 The calibration curve, generated over a concentration range of 10 to 100 mg/L, shows excellent linearity with a coefficient of determination greater than R2=0.999. From this calibration curve, the content of Irganox 1010 of Fig. 1 was calculated to be 10.8 mg/g of polystyrene (PS). Fig. 4 shows the molecular weight distribution curve for the additive-containing PS using the analytical conditions of Table 1. 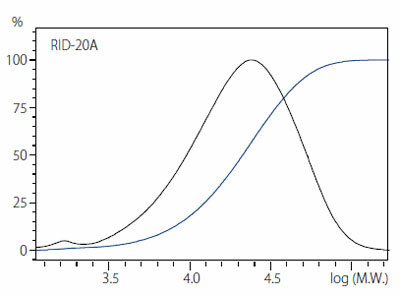 The black-colored trace plots the molecular weight data as a differential curve, and the blue-colored trace plots that data as an integral curve. The weightaverage molecular weight (Mw) and number-average molecular weight (Mn) were 26078 and 15422, respectively. In this case, the molecular weight distribution (polydispersity: Mw/Mn) was about 1.69.